Mercedes plans to build a production version of the Vision S 500 Plug-in HYBRID. MUNICH -- Mercedes-Benz will unveil a plug-in electric version of its flagship S class at the upcoming Frankfurt auto show. The car will debut as a concept, but Mercedes says it plans to bring the model into production as soon as possible. 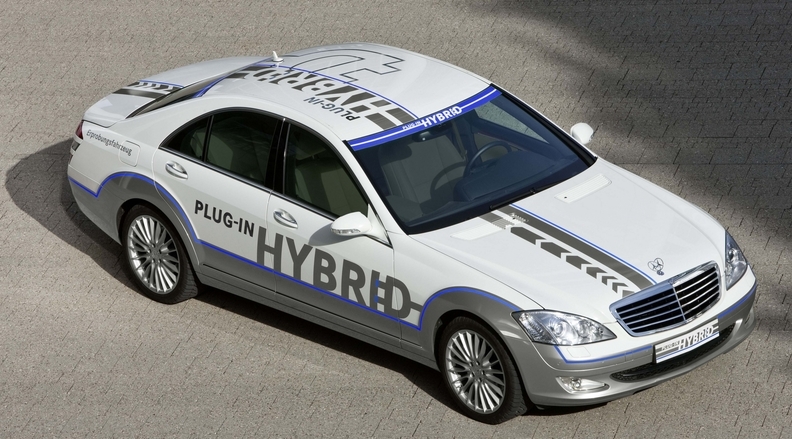 Called the Vision S 500 Plug-in HYBRID, the concept can drive for up to 30km (18.6 miles) at a time on electric power. Mercedes says the car uses 3.2 liters of gasoline per 100 km (74 U.S. mpg) and has CO2 emissions of 74 grams per kilometer. The concept is powered by a 3.5-liter V-6 direct-injection gasoline engine and a 44kW electric motor. Thomas Weber, the carmaker's research chief, said: "Although it will take some time before this model can go into series production, our engineers will be working full steam to carry out the necessary integration measures and ensure that all components can meet the tough everyday demands required of a luxury long-distance sedan." The car's lithium-ion battery pack can store more than 10 kWh of energy and can be quick-charged at a special charging station in less than an hour. A full charge from a household outlet takes four and a half hours. The concept is Mercedes' a third hybrid sedan, along with the recently launched S400 Hybrid and the near-production-ready Vision E300 Bluetec diesel hybrid, which also will debut in Frankfurt.